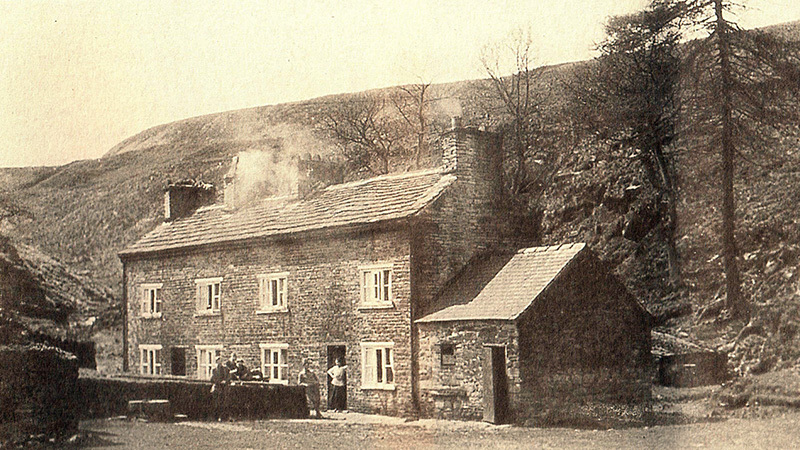 Above: The cottages at Goytsclough would probably have housed the mill manager’s family. I’ve just created a ‘then & now’ fade featuring one of my favourite views of the Goyt Valley (see below). The photo must have been taken around the end of the 19th century and would have been sold as a postcard in local shops. It shows three children standing behind the well-built cottages at Goytsclough. Goytsclough is an open area on the single track road between Errwood Reservoir and Derbyshire Bridge. I’d always thought the cottages must have stood on a raised, rectangular area which is easy to spot on the ground today. But having tried to replicate the view in the photo, it seems I was wrong. Above: Fade between the old and new using the buttons or the green slider. The stream in the foreground is Deep Clough. It once formed part of a fairly extensive water system that powered a giant waterwheel, reputed to be the second largest in the world. The wheel was first used to turn a millstone that scoured the surface of paving slabs. And some years after the quarry closed, it was put back into action to crush stone and extract a mineral used in paint manufacture (click for more info). I had wondered whether the hatched rectangle on the map might be the waterwheel – only because it looked too small to be the cottages, and I couldn’t think what else it could be. The flat rectangular ground to the north that I’d thought was the remains of the cottages must have been a loading or storage area – probably used by first by the stone quarry, and then the paint mill. And I’m sure the waterwheel must have stood in front of the outlet from the small reservoir, marked as ‘mill dam’ on the old map.